Founded in 2004 by the late alpinist Jonny Copp, the Adventure Film Festival has been a welcome addition to Colorado’s environmentally-minded outdoor film scene. The festival’s 2010 edition, which opens in Boulder on Thursday, will feature some 26 films, as well as workshops by adventure filmmakers like Michael Brown. The festival’s selection committee has a fairly broad definition of “adventure,” and this year’s entries range from straight-up sports flicks like Follow Me to environmental documentaries like Vanishing of the Bees. As an added bonus, some of the shorter films are available for free on Vimeo, so fans who can’t make it can still get a taste of the fest. Climbers Renan Ozturk and Cory Richards attempt a new line up Tawoche, a 21,320-foot peak in Nepal. 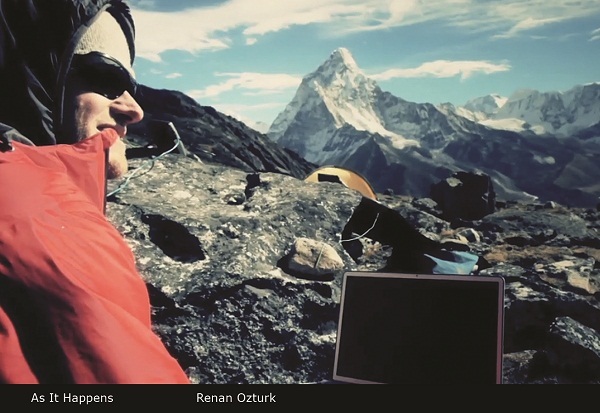 As they go, they film their adventure and release it from the field in a series of video dispatches, editing and uploading it to Vimeo from a tent high in the Himalayas. Personally, I think it’s brilliant. While other climbers have dabbled in reporting from the field, very few besides Ozturk have turned out this kind of big-screen-worthy footage. As It Happens says something very interesting about the ways in which mobile media is changing the documentary process. I’ve watched my fair share of bass fishing on ESPN, and I still think calling it a sport is a stretch at best. Compared to mountain biking, rock climbing, and skiing, fishing seems like a dull subject for a movie. That said, I’ll give Eastern Rises the benefit of the doubt. This documentary on a trout-fishing expedition to the Kamchatka Peninsula has a lot going for it. From the little I’ve seen, it seems to focus as much on its spectacular setting than on the angling itself. Felt Soul Media has a track record of putting out very soulful, place-based films too, so this one might be worth a watch. Ever since I first heard of Andrew McAuley, I’ve been captivated by his story. McAuley, a kayaker and adventurer from Australia, disappeared in 2007 during an attempt to paddle solo from Tasmania to New Zealand. By that point, he had spent nearly a month alone on the ocean. Solo uses interviews and video footage recovered from McAuley’s kayak to attempt to reconstruct his final voyage. We get to hear much of the story directly from McAuley himself, in the form a video diary he kept throughout his trip. The recording of his distress call, played at the beginning of the trailer, made me physically shudder. This impeccably-shot little film tells the story of Skateistan, Kabul’s first skate park and school. Founded in 2009, the park offers classes in both skateboarding and subjects like reading and computer skills, and is one of the few athletic organizations in Kabul to be equally open to both girls and boys. Skateistan mostly bypasses complex political issues, instead focusing on how skateboarding has helped the park’s kids deal with everyday problems like poverty and gender bias. Some of the kids are more than a little punk, too. For those who can’t make it to Boulder, the full nine-minute film is also available on Vimeo. Matador Nights has more info on film and music festivals around the world.